Two of ÅF's lightingprojects have reached the final in the prestigious Swedish Lighting Award – the unique Kungliga Biblioteket Annexet and the breathtaking bridge of Sölvesborg. "I am proud and excited that our projects are being recognized, Kai Piippo, Chief Designer at ÅF, says. We want our lighting solutions to focus on the lives and needs of the people who use them – improving well-being and daily life. This nomination proves that we have reached our ambitions in this regard”. KB Annexet is linked to Stockholm’s National Library. Besides lots of books there is plenty of room for research, studying and reading. KB Annexet was rebuilt in 2012 and the lighting was designed to adapt to the visitors different needs and to create a balance between the bright daylit spaces and the more dark areas of the building. 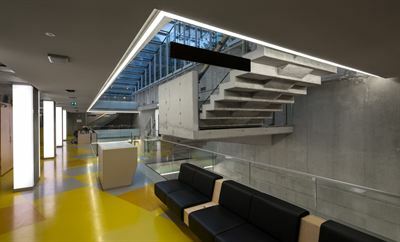 Today the Annext is an attractive place where people love to stay and the lighting concept succeeded in offering a variety of locations around the three floors below ground. The Sölvesborg Bridge is the longest bicycle and pedestrian bridge in Europe. Special attention has been given to the design and the spectacular nightscape. The area around the bridge is a nature reserve sanctuary with a rich birdlife. The lighting has been made with respect for the wildlife and is inspired by the migration cycles of birds. The colours on the bridge change over the year and during the night, creating a dynamic landmark seen from a long distance. This summer over 60 000 people has crossed the bridge!